So, I wrote this last Halloween for The Nephew. 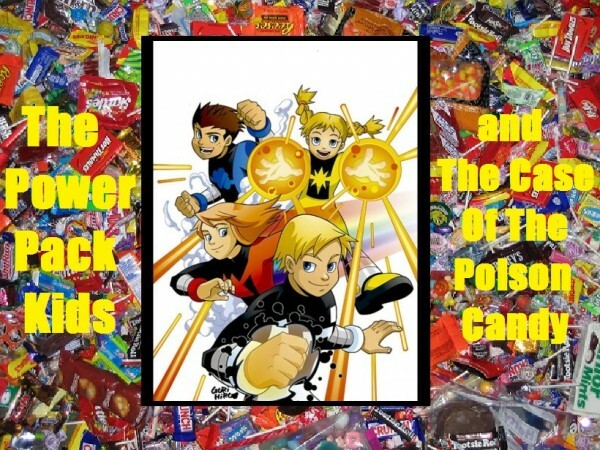 He prompted me Power Pack Kids, dommbots and a poison candy theft ring. He was in shock that I knew who the Power Pack was and then didn't believe me that they used to work with Spiderman. (apparently they work with Wolverine now). Phweft, kid, he forgets that I was reading comics before his dad was even out of diapers! Anyways, here you all go, Happy Halloween! 2,883 words. Characters/Pairing: Alex, Julie, Jack & Katie Power and Wolverine. Summary: The Power kids just want their trick-or-treats, but someone else has other plans in mind. Disclaimer: Marvel owns everything. I wrote this story, for free. Author's Notes: I told The Nephew about my Spiderman story idea and he said, “Uh, no,” and then asked for a Power Pack fic instead. He was super shocked to realize that I knew who The Power Pack even was, but confounded at my insistence that they worked with Spiderman back in my day. Apparently nowadays they work with Wolverine. And since The Nephew is my spoiled boy, I wrote him the fic, based off his prompt of doombots and a poison candy theft ring. Dedication: To The Nephew, my comic book geek boy and the owner of this entire plot-line! I love his imagination at work! Art by me, pics taken from the internet. “Our Halloween costumes are ready,” Julie said. Her siblings all turned to look, where their Halloween costumes were hanging in the corner of the room. “Cool, Star Wars!” Jack shouted. “Which one’s mine?” Alex asked. There was only one costume left - Darth Vader. “Because I’m Princess Leia,” Julie told her. “Because I’m older than you and I said so,” Julie told her and then stuck her tongue out at her younger sister. Katie opened her mouth to protest that ‘because I said so,’ wasn’t even a real argument, when they all heard a scream from across the street. “Well, I guess we are wearing our other costumes for awhile first,” Alex said. They all suited up and ran outside, to find a young boy dressed in a Shrek costume, laying on the ground, while his sister - dressed as Elsa - was standing over him. “What happened?” Katie asked her. “He just ate a piece of candy and then he fell over and now he won’t wake up,” the sister said and started crying. “Alex, call 911 and stay with them,” Julie told her brother and then picked up the boy’s bag of candy and raced back home. Alex came back fifteen minutes later and told them that the boy was being rushed to the hospital. “Hey guys, look at this,” Jack said and turned the TV at an angle, so they could all see the screen. A news reporter was standing in front of a school. “What about our trick or treats?” Jack asked, bottom lip quivering. There were too many places to cover; schools, churches, random kids falling ill on the sidewalks and in their homes. The Power Pack had to split up. That might not have been such a good idea. Alex took off after the doombot as fast as he could, which unfortunately wasn’t fast enough. When he rounded the corner, the doombot was long gone. “I’m going to need someone with a pair of wheels,” he said to himself and pulled out his communicator. Julie was next to see a doombot. It had a teenage boy pinned to the ground The boy was clutching a pillowcase full of candy in his hand and the doombot was prying it away. “Hey, man, get off me!” the boy yelled. Julie ran at the doombot with full speed, which was quite fast given it was her super-power and all - they didn’t call her Lightspeed for nothing - and slammed into the bot. It stumbled backwards, ripping the pillowcase of candy out of the boy’s hand as it did so. “That dude stole my candy!” the boy cried. “That’s not a dude, it’s a robot,” Julie told him and clicked the button on her communicator, before chasing the doombot - and the stolen candy - down the street. Jack was heading into the same school they had seen on the news, when he passed the reporter from earlier. She was fishing around in her coat pocket, only to pull out a small piece of candy. She popped the candy into her mouth and swallowed. Jack shrugged and started to walk away when he heard a thud. He turned around to find the news reporter had collapsed on the ground. She was sound asleep. “Sound asleep forever,” Jack said. He ran down the street, looking for an ambulance to help the woman. Instead he found a doombot, slamming its way through the doors of a church. “Oh great, now I’ll never get trick or treats,” Jack said and flipped on his communicator. Katie was the last to see a doombot. She’d headed to the hospital to sneak a peek at the medical records of the children who had been poisoned, so she could read the reports to her dad, who was working on an antidote. The doombot was at the counter in the hospital’s lobby. There was a big bowl of Halloween candy sitting there and the doombot was dumping it all into a black bag it had tied around its own middle. “Hey! That’s not for you!” Katie shouted. The doombot turned to go the other way, so Katie blasted it with her energy ray. Only she missed. The doombot managed to get away and Katie left a hole in the wall of the hospital. “Oops,” Katie said. “Maybe I could use some help.” And she switched on her communicator and pressed the button. “Hello?” Wolverine said, as grumpy as he should be when someone was interrupting him watching a marathon of scary movies for Halloween. “Stealing candy and spreading poison,” Wolverine said. Wolverine clicked a button and said, “Hello?” again. Wolverine met them all at their dad’s lab, where Katie handed over copies of the poisoned children’s medical records to her father. “Zero-G, just explain what the heck you are even talking about,” Wolverine said. He was still pretty mad about his scary movie marathon being interrupted. “I have some candy…”Alex started to say when both Jack and Julie ran at him. “You have candy? Give me!” Jack shouted. Julie didn’t say anything, just ran at light-speed towards her brother, knocking him to the ground in the process. “Hey!” Wolverine and Alex shouted at the same time. “Sorry, I got sugar crazy,” Julie said. “To ruin trick-or-treats,” Jack said with a pout. “To ruin trick-or-treats,” Katie agreed. “If they are doombots, they can only be coming from one person,” Alex said. “Doctor Doom,” Wolverine growled and his claws popped out with anger. “Will do, Pops,” Wolverine said and they all headed out. Wolverine made a few phone calls, until he found someone - Captain America - who knew the location of Doctor Doom’s latest liar. It was way on the outskirts of town, set back into a rock wall that had a cave hollowed out inside of it. It looked rustic and wild from the outside, but they all knew on the inside was some serious fire-power. “Because it’s serious business time,” Jack said. “You got it, bub,” Wolverine told him. Jack squared his shoulders. “Mass Master, ready to go,” he said. Julie did the same. “Lightspeed, ready to go too and also,” she said. Katie just smiled. “Energizer is always ready to go,” she said. “Guess Wolverine is ready to go too,” Jack muttered under his breath. “Let’s move out,” Wolverine told them. Getting into the cave was easier than expected, but they knew they had been seen the minute Alex spotted a security camera watching them. “Guess we lost the element of surprise,” Julie said. “Well, let’s just be fast about it then,” Wolverine told her. Julie took this literally and ran at full light-speed into the cave. “Holy moly!” the rest of the team heard her yell from in the cave. They all darted inside to see Julie running around the room, crashing into doombots with the full force of her speed. Crashing into a lot of doombots, that was. More than a hundred of them. There was also a large machine in the middle the room and a bot was dumping bags of candy into it. The machine would slime down green ooze onto the candy and then spit the candy back out the other side, where other doombots were packing it all back into Halloween bowls. “My trick-or-treats,” Jack yelled and started to run for the candy, but Wolverine reached out and held him back by his arm. “We need to disable it,” Jack said. “Got it,” Jack said and looked over at the bags of candy one last time. “I’m coming for you, candy,” he said and then closed his eyes, let his molecules expand and then shrink, float around inside him until he had the desired effect of downsizing his whole body to a mere eight inches tall of nearly impenetrable force. “A little help here!” Julie shouted at them then and she stopped running and crashing into robots long enough for them to see that one of her shoulders had been dislocated. Jack used his small size to try and dart past the doombots unseen while the rest of the team started attacking as many as they could get their hands on. Katie began grabbing the doombots, one at a time, and quickly absorbing their energy, then using it to shoot a blast straight out of the center of her power-suit. It worked well, offering her the chance to take down two or three bots at a time. Wolverine was taking his metal claws and stabbing them straight into the electrified doombots. The combination of the electricity of the bots and the metal of his claws caused the doombots to short-circuit right out, though it also unfortunately gave Wolverine quite a jolt each and every time. His hair was standing on end just a bit more than usual. Jack - still only eight inches of dense matter mass - was trying his best to get to the control system, but the doombots had seen him now and were charging at him. Thankfully, due to his matter density, he was mostly unharmed by these attacks. Until one bot went to step on him. “I’ve got you, Mass Master,” Alex shouted and grabbed the bot when it was just a half of an inch from crushing Jack from above. Alex put his super powers into effect and gravitated the doombot right up off the ground and away from Jack. After that, Alex stuck with his brother, clearing him a path to the control system. There was lightning going on everywhere, explosions all around, and some of the doombots still continued to load candy into the poison machine. Jack was close enough to the control panel now that he could read all of the little dials, but not quite close enough to reach. There were a dozen bots blocking his way. “I’ve got this,” Alex told him, but Jack just held up his hand. “No thanks, bro. I’ve got this,” Jack said and closed his eyes, dissolving into a gas matter right there in front of the bots. Then he floated through their line of defense and rematerialized on the other side. The doombots were completely confused, looking around for where Mass Master had gone, and even more confused when Zero-G grabbed a hold of them and they all started levitating off the ground. “I’ve got to figure out how to shut this down,” Jack said to himself and started pressing buttons and turning dials, looking for anything with the words, ‘power’ or ‘off’ on it. Suddenly there was a huge explosion from behind him and Jack looked over his shoulder to see both Katie and Julie emerging from a cloud of smoke. “Oops,” Julie said, face covered in ash. “I said ‘oops’,” Julie reminded her. “I don’t know how to shut it down!” Jack hollered back at him, because it’s not like Wolverine knew anything about super computers either. Jack jumped back, bracing for an explosion, as he was sure Wolverine was just going to jam his claws into the computer. “Wait, you’ll electrocute yourself!” Julie shouted, also clearly convinced that Wolverine was going to claw the computer to death. …And came back up with an electrical cord in his hand, the plug at the end swaying back and forth. “I think this should do it,” he said with a smirk. As soon as the cord was unplugged, the computer shut down, all the little lights and blinkers turning off as the monstrous machine went to sleep. Behind them, all of the doombots went to sleep as well. Julie poked at one and it didn’t even move. “So, now what?” Wolverine asked, cord still dangling from his hand. “I look ridiculous,” Wolverine complained and scratched at his chest, where the kids had wrapped several rolls of carpet around him and the rest of his body as well. “Chewie doesn’t talk, he just makes noises,” Katie told him and adjusted her Darth Vader cape. “I’ll give you a noise,” Wolverine told them and then growled at them with a ferocity that made them all recoil a little. “My trick-or-treats!” Jack shouted at him and Wolverine fell silent. There was a National Guard truck at the corner of the street and kids in costumes were lined up to get candy - fresh, new, non-poisoned candy - from the gentlemen handing it out. Alex herded them all into line. Just then their communicators beeped and Julie looked down at her screen to see her dad standing next to the bed of the first boy they had seen ill that night - the one in the Shrek costume - sitting up in his hospital bed, wide awake.